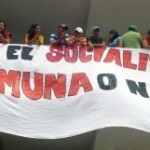 Argentina: the unity of the trade unions wins popular layers to the workers. THE 21 FEBRUARY (21.F) DEMO AND THE UNITY OF THE TRADE UNIONS ARE DEFEATING THE MACRI GOVERNMENT. In December 2017, the Macri government imposed its Social security Reform programme by means of violence. Although the government keeps hitting people, Argentina does not surrender. The latter are on a war footing. They take to the streets with determination, winning over to their side wider sectors of society. In this great historic march of 21.F, they unite with the Trade Union movement in a demonstration of resistance which is not likely to be reversed in this year. 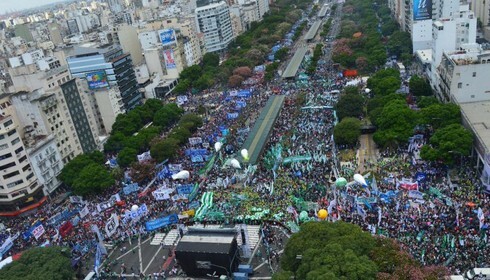 This mass demonstration – 450,000 people – flooded the biggest avenue of Buenos Aires, putting to shame the hegemonistic media that, from the Clarin journal to the TV Chains, orchestrated an odious campaign with a view to stopping it. They spoke of a “demonstration of the trade unions mafias”, but what happened was a massive and categorical indictment of the Macri government’s economic policies! In Brazil, the people had used the Carnivals to indict the Temer government (see our other article on Brazil) with cries of “Temer, if you throw Lula in prison, the favelas will descend on you from the hills”. In this case, in Argentina, the population made the football stadiums centres of communication from where you could hear: “Macri Son of a B..!” This was not a slogan of course, but it expressed well the general state of social discontent. The Argentinian workers made historic gains under Peronism and Kirchnerism. Now the attacks against those gains are reaching peaks: all you see is the desolation of mass unemployment and onslaughts against pensioners. The impoverishment of the population has been flagrant over the last two years. Shocking events succeed each other day after day. Enterprises and mines close down. The medical personnel of the Great Hospital Posadas* has been made redundant. In the province of Buenos Aires, state schools are being closed and abandoned by the dozens. Macri’s famous promise to end poverty turns into ending the poor. In this climate, the CGT bureaucracy comes to an impasse because it no longer has much choice: the CGT either regenerates and empowers new Trade Union leaders – or it climbs on the government’s boat and sinks together with it. Old Trade Union bureaucrats have been known to do this kind of thing in the past. Hugo Moyano is an old bureaucrat in the truckers sector. As accusations of corruption started flying against him under Macri, he felt the need to distance himself from the government and draw closer to the workers. His son, Pablo Moyano, a trucker himself, is now leading that sector of workers. In the 21.F march, the truckers came. They joined forces with teachers and others from the Central de Trabajadores de la Argentina (CTA) – a federation of Unions (Gen. Sec. Hugo Yasky). Many parliamentarians came too, along with independent sectors, traders and citizens. They all joined in the imposing body of the Argentinian workers’ unions. From the time when Macri imposed violently the Social Security Laws last year, his popularity collapsed in the polls. He wanted to show the workers as violent people led by a Trade Union Mafia, but nobody was listening to him any more. The leaders of the mobilisations decided to keep holding meetings. They prepare a Plan of Struggle for the coming period. They are supported in this matter by assemblies and meetings in the factories, in the workers areas and in the Trade Unions. The aim is a General Strike to stop the Labour Reform Laws being brought in, and have last year’s Social Security Reform Laws revoked. About the latter, a non-stop media war had surrounded their violent enactment last year; all the law-makers had been pressurised. Even the right-wing Peronist governors who had voted Macri had been targeted. This 21.F March brings strength to the struggle. It contributes new elements to the forces of the opposition. Unlike the Social Security Laws last year, the [coming] Labour Laws are forced to confront a reunifying Trade Union movement. The latter is creating a force that does not give up easily as it casts aside chunks of bureaucracy. 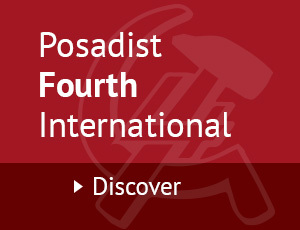 This draws to the workers’ side new middle class sectors, like the small entrepreneurs ruined by the destruction of the productive sector and the invading torrent of inward investments. Electoral calculations are now being made for 2019, with projects for the return of Cristina Kirchner. The Argentinian people seek the recovery of their social conquests, their human rights and their right to dignity.